Visit southern Colorado, and you’ll find a landscape that looks much as it did centuries ago, with craggy, towering peaks, windswept plains, and, of course, the iconic sand dunes. There are a few hardy communities in this awe-inspiring landscape, but venture outside of those, and you’ll hardly see another soul. As you explore the wild terrain, you might get the sense you’ve stepped back in time. And, you just might think you’ve leaped to the Old West days if you board the Rio Grande Scenic Railroad train, which allows passengers to experience the rugged San Luis Valley much the same way people did in the late 1800s. 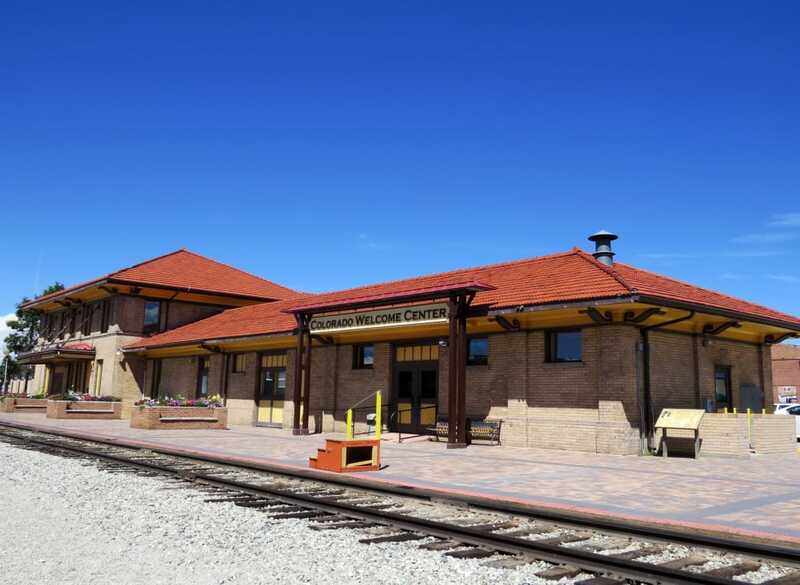 Departing from Alamosa, the train offers full-day excursions, winding through the mountains and ending at La Veta, where passengers can enjoy art galleries and a variety of restaurants. For another option, you can board the Cumbres & Toltec Scenic Railroad in Antonito and ride it to Chama, N.M., climbing higher than 10,000 feet as the train rumbles through southern Colorado. No matter which train you take, you’ll find that it’s an exciting way to soak in the beauty of the San Luis Valley and the surrounding mountains. Like much of the western United States, the San Luis Valley was made infinitely more accessible to the rest of the country when railroad tracks connected it to important industrial centers around North America. In fact, it’s directly responsible for the existence of the Alamosa we know today—the Denver and Rio Grande Western Railroad shipped buildings to the town site, and, over the course of a single day in May 1878, Alamosa took shape. In the years since its establishment, Alamosa and the railroad have continued to be inextricably connected. By 1890, just over a decade after Alamosa was incorporated, it had become the most important hub for North American narrow gauge railroading. Freight trains came and went daily, bound for the nearby towns of Creede, Salida, and Durango, plus big-name destinations like Denver and Santa Fe. Cars came in with loads of sheep, cattle, farming necessities, and lumber, and then departed laden with the fruits of the San Luis Valley’s labors: mining and agricultural products. For 60 years, passengers and freight alike made the journey to the San Luis Valley. Then, beginning in 1950, the tracks were used only to transport cargo around Colorado and the rest of the country. Passenger services were on hiatus until 2006, when the Rio Grande Scenic Railroad became a heritage railway and began offering scenic tours once again. These days, if you ride the Rio Grande Scenic Railroad you can chug along with the Lake Superior and Ishpeming Railroad Locomotive #18, which was built in 1910 and previously operated at both the Grand Canyon Railway and the Mount Hood Railroad. Its other cars date back to the 1920s and have histories at other historic and scenic railroads all over the country. Trains depart during the week from the depot in downtown Alamosa from May through early October. From there, you’ll pass—in air-conditioned comfort—through historic Fort Garland, built in the mid-19th century to keep San Luis Valley settlers safe. This section of the journey also affords views of Mount Blanca, which stands at 14,345 feet and is among the state’s most picturesque Fourteeners. If you take a full-day excursion during the week you’ll leave Fort Garland and proceed to La Veta, a teeny town Nestled in the shadow of the Spanish Peaks. La Veta is filled with one-of-a-kind restaurants and inspiring art galleries, and it has long been a gathering place for local artists. If you ride the train during the weekend, you’ll leave Fort Garland and rumble on to Fir Summit, which sits at the top of La Veta Pass. Fir is more than just railroad stop, though: it’s also an outdoor concert venue accessible only via the Rio Grande Scenic Railroad. During the Spring Fire this summer, the Fir Summit concert stage burned down, but the railroad plans to restore it. Fortunately, the rest of the venue was untouched, and concerts will go on as planned utilizing the brick dance floor as the stage. During your ride, you’ll be well fed. The railway offers various passenger classes throughout the season, depending on when and where your particular tour is headed. Fall is a particularly excellent time to go, as you’ll get to experience the unbelievably vibrant fall colors of the Sangre de Cristo Mountains. The railroad also offers a number of special events throughout the season, including concerts at Fir Summit. If, after a ride on the Rio Grande, you still haven’t had your fill of railroad adventure in the San Luis Valley, you’re in luck: there’s more where that came from. The Cumbres & Toltec Scenic Railroad operates coal-fired, steam-operated, narrow-gauge locomotives that depart from Antonito, Colorado (which is just a 30-minute drive south of Alamosa), and Chama, New Mexico. Originally an extension of the Denver and Rio Grande Western Railroad, the Cumbres & Toltec rail line was completed in 1881 with the intention of offering additional support for mining operations in the San Juans, and it connected the San Luis Valley to Durango. The trail is named for Cumbres Pass, which at 10,015 feet is the highest railroad-accessible pass in the U.S., and the Toltec Gorge. Both the pass and the gorge sit along the railway’s route. Eventually, as mining operations slowed, the need for a railway connecting the two towns receded, and for a time it looked as though the Cumbres & Toltec might be abandoned. Fortunately, in 1970, Colorado and New Mexico went in on a joint purchase to preserve the 64-mile section of the railroad’s original route between Antonito and Chama, New Mexico. 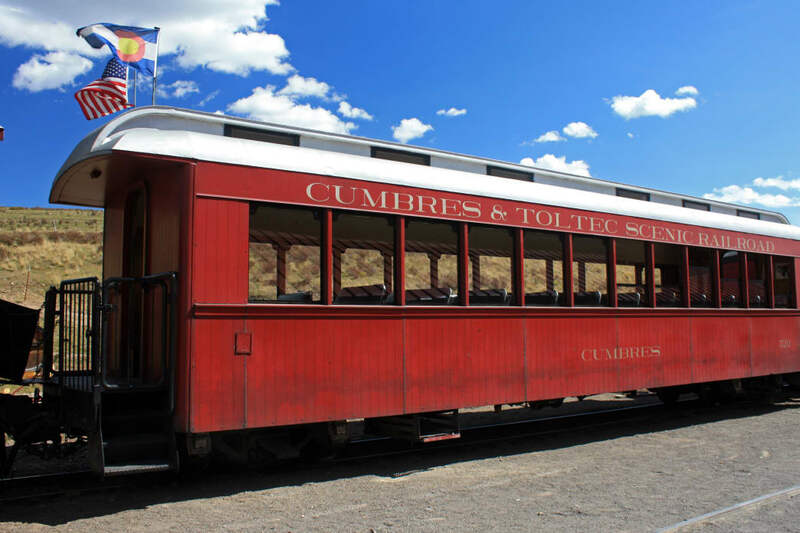 Cumbres & Toltec offers half- and full-day trips, making it possible to experience all the rugged beauty southern Colorado has to offer. Lunch is included with ticket prices, and dinner is offered for the railway’s special events. Whether you’re looking for a way back in time or simply want to see the majestic landscape in all its present-day glory, your best bet is to hop aboard one or both of the San Luis Valley’s historic trains. In addition to the unique opportunity to take in the scenery without having to worry about actually steering your vehicle, you’ll be transported to places—and times—you can only experience from the passenger seat of a railway car.